These two volumes continue and then finish up the murder mystery story that started in volume 9. I had a lot of high hopes for this storyline, but in the end I found myself a little disappointed. Arthur, a character introduced last volume meant to represent Sir Arthur Conan Doyle, goes over all the clues to figure out the reason for the murders, only to have all the clues looked at again when a mysterious vicar, playing the part of a hyper-observant Sherlock Holmes, shows up to analyze everything again. This is stretched over the entire tenth volume, resulting in a drag in the story. At the very end of volume 10 Arthur figures out what we all knew pretty much the entire time — that Sebastian is not really dead. (sorry if I spoiled anything, but did you really think that the supernatural title character would go out because someone whapped him on the head?) 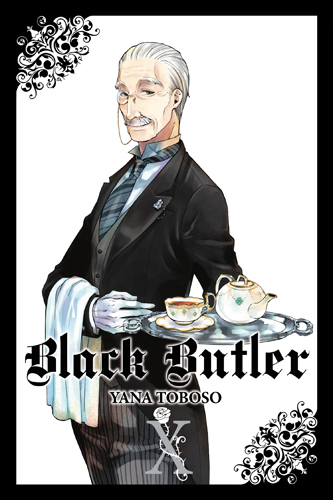 The real culprit turns out to be the Queen’s butler, who was exacting his own punishment for Ciel’s final actions at the end of the circus story arc. While this creates an interesting dynamic for later on — will this butler prove an enemy — it feels like a bit of a cheat to this storyline. Also disappointing is that, in the end, Arthur’s character serves as nothing more than a narrator, and as someone to whom Sebastian and Ciel can reveal the real underlying plot for the benefit of the reader. The most interesting twist comes at the end of volume 11, when it’s revealed that one of the three deaths was not in the plan. The revelation of another killer ties this story arc more firmly with the preceding one, and the decision to keep him as part of the overall plot reminds us that Ciel is not actually a good person, and may even have more darkness in him than his devilish butler. While I didn’t turn out to love this story arc as much as I hoped, it’s still far from being the most boring part of this manga. It’s a pity that this storyline started to slog, but as usual it picked up again when the supernatural aspect became a more natural part of the plot. 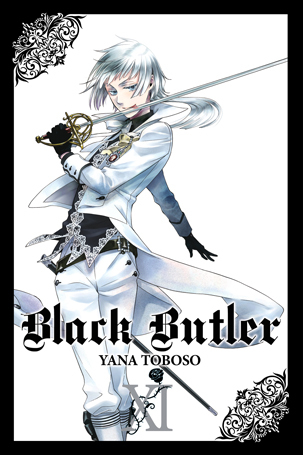 These volumes have their far-too-goofy moments, such as how they reveal to the other servants that Sebastian isn’t actually dead (the biggest plot hole I’ve seen yet in this manga) and the expected but still disappointing way that the older butler Tanaka returns to his super-deformed, derpy state after spending so many chapters being clearheaded and formidable. The manga takes a disturbing (and welcomed!) turn at the end of volume 11, and I look forward to seeing what Toboso decides to do with it. Review copies provided by Yen Press.